The banks are busted and cutting the interest rate must have seemed like the only option Fed chairman Ben Bernanke had. The sudden and shocking depletion of bank reserves is due to the huge losses inflicted by the meltdown in subprime loans and other similar structured investments. As commentator Mike Whitney says, even as we are entering uncharted waters, the banking system is basically underwater and insolvent. Somebody goofed. 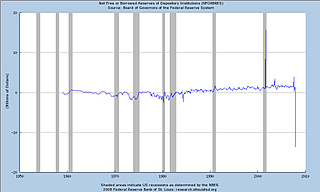 When Fed chairman Ben Bernanke cut interest rates to 3 per cent January 30, 2008, the price of a new mortgage went up. How does that help the flagging housing industry? About an hour after Bernanke made the announcement that the Fed Funds rate would be cut by 50 basis points, the yield on the 30-year Treasury nudged up a tenth of a per cent to 4.42 per cent. The same thing happened to the 10-year Treasury which surged from a low of 3.28 per cent to 3.73 per cent in less than a week. That means that mortgages which are priced off long-term government bonds - will be going up, too. 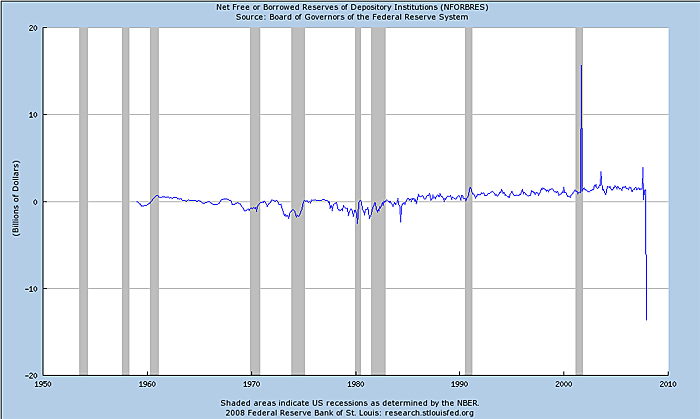 Is that what Bernanke had in mind; to stick another dagger into the already-moribund real estate market? The Fed sets short-term interest rates (The Fed Funds rate) but long-term rates are market-driven. So, when investors see slow growth and inflationary pressures building up; long-term rates start to rise. That's bad news for the housing market. Now, here's the shocker: Bernanke KNEW that the price of a mortgage would increase if he slashed rates, but went ahead anyway. Because eight days ago, when he cut rates by 75 basis points, the 10-year didn't budge from its perch at 3.64 per cent. It just shrugged it off as meaningless. But a couple days later, when Congress passed Bush's US$150 BILLION "Stimulus Giveaway", the 10-year spiked with a vengeance - up 20 basis points on the day. In other words, the bond market doesn't like inflation-generating government handouts. 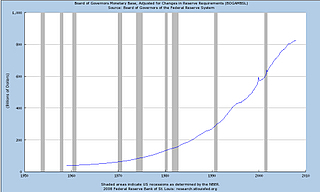 The only reserves [banks] have is capital they borrowed from the Fed. So, why did Bernanke cut rates when he knew it would just add to the housing woes? Click on the charts for a better view. 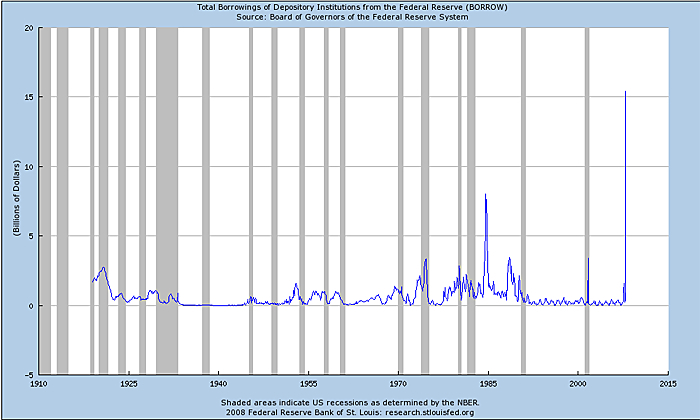 The first graph (Total borrowings of Depository Institutions from the Federal Reserve) shows that the banks are capital impaired and borrowing at a rate unprecedented in history. The second graph (Non borrowed reserves from Depository Institutions) shows that the capital that the banks do have is quickly being depleted. 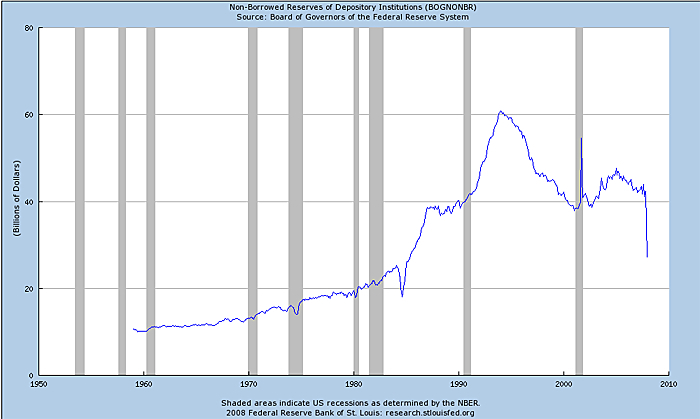 The third graph (Net Free or borrowed reserves of Depository Institutions) is best summed up by econo-blogger Mike Shedlock who says: "Banks in aggregate have now burnt through all of their capital and are forced to borrow reserves from the Fed in order to keep lending. Total reserves for two weeks ending January 16 are $39.98 billion. Inquiring minds are no doubt wondering where $40 billion came from. The answer is the Fed's Term Auction Facility." 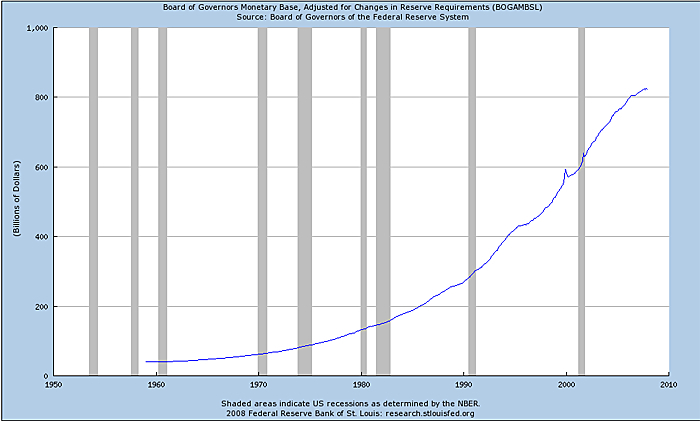 (Mish's Global Economic Trend Analysis; http://globaleconomicanalysis.blogspot.com/) So the only reserves they have is capital they borrowed from the Fed. A careful review of these graphs should convince even the most hardened skeptic that the banking system is basically underwater and insolvent. We are entering uncharted waters. The sudden and shocking depletion of bank reserves is due to the huge losses inflicted by the meltdown in subprime loans and other similar structured investments. The debt-securitization process is in a state of collapse. The market for structured investments - MBSs, CDOs, and Commercial Paper - has evaporated leaving the banks with astronomical losses. They are incapable of rolling over their short-term debt or finding new revenue streams to buoy them through the hard times ahead. As the foreclosure-avalanche intensifies; bank collateral continues to be down-graded which is likely to trigger a wave of bank failures. Henry Liu sums it up like this: "Proposed government plans to bail out distressed home owners can slow down the destruction of money, but it would shift the destruction of money as expressed by falling home prices to the destruction of wealth through inflation masking falling home value." (The Road to Hyperinflation, Henry Liu, Asia Times) It's a vicious cycle. The Fed is caught between the dual millstones of hyperinflation and mass defaults. There's no way out. The pace at which money is currently being destroyed will greatly accelerate as trillions of dollars in derivatives are consumed in the flames of a falling market. As GDP shrinks from diminishing liquidity, the Fed will have to create more credit and the government will have to provide more fiscal stimulus. But in a deflationary environment; public attitudes towards spending quickly change and the pool of worthy loan applicants dries up. Even at 0 per cent interest rates, Bernanke will be stymied by the unwillingness of under-capitalized banks to lend or over-extended consumers to borrow. He'll be frustrated in his effort to restart the sluggish consumer economy or stop the downward spiral. 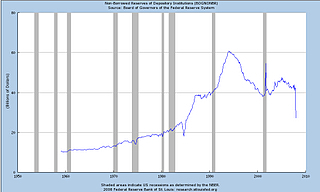 In fact, the slowdown has already begun and the trend is probably irreversible. A careful review of these graphs should convince even the most hardened skeptic that the banking system is basically underwater and insolvent. The financial markets are deteriorating at a faster pace than anyone could have imagined. Mega-billion dollar private equity deals have either been shelved or are unable to refinance. Asset-backed Commercial Paper (short-term notes backed by sketchy mortgage-backed collateral) has shrunk by $400 billion (one-third) since August. Also, the market for corporate bonds has fallen off a cliff in a matter of months. According to the Wall Street Journal, a paltry $850 million in high-yield debt has been issued for January, while in January 2007 that figure was $8.5 billion - ten times bigger. That's a hefty loss of revenue for the banks. How will they make it up? Judging by the Fed's graphs; they won't! Bernanke's rate cuts sent stocks climbing on Wall Street on January 30, but by early afternoon the rally fizzled on news that Financial Guaranty, one of the nation's biggest bond insurers, would be downgraded. The Dow lost 37 points by the closing bell. "MBIA Inc, the world's largest bond insurer, posted its biggest-ever quarterly loss and said it is considering new ways to raise capital after a slump in the value of subprime-mortgage securities the company guarantee. The insurer lost $2.3 billion in the fourth-quarter. Its downgrading from AAA will cripple its business and throw ratings on $652 billion of debt into doubt. Many of the investment banks have assets that will get a haircut." 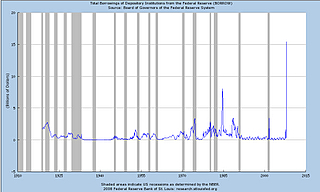 The Fed is caught between the dual millstones of hyperinflation and mass defaults. There's no way out. The bond insurers were working the same scam as the investment banks. They found a loophole in the law that allowed them to deal in the risky world of derivatives; and they dove in headfirst. They set up shell companies called transformers (the same way the investment banks established SIVs; Structured Investment Vehicles), which they used as off balance sheets operations where they sold "credit default swaps, which are derivative instruments where one party, for a fee, assumes the risk that a bond or loan will go bad. (The Bond Transformers, Wall Street Journal.) The bond insurers have written about $100 billion of these swaps in the last few years. Now they're all blowing up at once. Neat trick, eh? Who wouldn't want to enjoy the profit from a job before they've done a lick of work? Even now that the whole swindle is beginning to unravel - and tens of billions of dollars are headed for the shredder - industry spokesmen still praise credit default swaps as financial innovation. Go figure? The leaders of Europe's four largest economies (England, France, Germany, Italy) held a meeting this week where they discussed better ways to monitor the world's markets and banks. They did not, however, push to create a new regime of oversight, regulation and punitive action that would be directed at financial fraudsters and their structured Ponzi-scams. Politicians love to talk about greater transparency and watchdog agencies, but they have no stomach for establishing the hard-fast rules and independent policing organizations that are required to keep the carpetbaggers and financial hucksters from duping gullible investors out of their life savings. That is simply beyond their pay-grade. "If these agencies don't reform themselves, the Europeans would turn to regulatory response to enforce change."